Veera Item Builds Guide for Arena of Valor (AoV). Each build is geared toward a different play style, so choose one that fits your personal preference. Hecate’s Diadem While not offering any fancy effects to her kit, Hecate’s Diadem is a very effective way for players to gain large amounts of ability power rather quickly. Its quality of providing additional ability power for each point of ability power you purchase in other items leads it to having the potential to provide the single highest amount of ability power in the game. Holy of Holies Similar to Hecate’s Diadem, Holy of Holies provides an immense stat boost rather than any sort of unique passive effect. If that weren’t enough, the item also provides a substantial amount of HP, giving the holder some chance to stand up to enemy aggression. Frosty’s Revenge If wanting some extra utility in her kit, Frosty’s Revenge can give Veera some impact in team fights outside of simple damage. The item slows those struck by the wielder’s abilities, making them easier targets for her allies. This also provides Veera with some much appreciated movement speed, helping out with her mobility issues. Orb of Magi This is a great item to grab early game as it helps its holder stay in lane and grows in power as the game goes on. The stats that it naturally provides are nice as well, giving the holder ability power, health, and cooldown reduction. Boomstick Boomstick is another source of raw damage. Not only does it offer a large amount of ability power, it gives abilities an additional explosion which effectively adds another 1.0 AP to the ability’s scaling. This can make Veera very bursty, something that her assassination gameplay is well suited for. Berith’s Agony More defensive than other offerings, Berith’s Agony allows Veera to build up some armor without a huge compromise to her ability power. The item additionally offers some cooldown speed to help Veera cast her abilities more frequently, as well as a passive that causes her abilities to deal out more damage based on the enemy’s health. Rhea’s Blessing Another more defensive choice, Rhea’s Blessing gives Veera a bit of sustain. This is through its magic life steal, restoring some of its wielder’s health whenever they deal damage with an ability. In addition, the item provides a shield to the caster when their health falls into dangerous territory, giving them a bit of additional time to either escape or take out their opponent. Staff of Nuul Staff of Nuul is for when the enemy team has a lot of magic defence. The item allows Veera to tear through a percentage of their defenses and always be able to influence the fight with damage as a result. Enchanted Kicks Enchanted Kicks offers a way to tear through enemy magic defense and improve the wearer’s damage as a result. When wanting to fully go on the offensive, these are going to be the best boots for the job. Hermes Select Given her mobility problems, Hermes Select can be a great way to get around the battlefield. It provides a large amount of additional movement speed while outside of combat, allowing the wearer to easily move between the lanes. With these, Veera can quickly move to enemies who have wandered out of position to pick them off. Gilded Greaves Gilded Greaves is the most normal answer to an enemy team who has a lot of crowd control at their disposal. Already suffering from low mobility, Veera is defenseless if stunned or slowed, so having an out can be a valuable asset. This is a very typical caster build, centered simply around dealing as much damage with spells as possible. Each (non-boots) item offers large amounts of ability power to the wielder, pumping up each of Veera’s abilities’ damage. Boomstick and Berith’s Agony additionally offer damaging passives to her arsenal as well, making the first ability of her combo devastate when it hits. Veera will have a lot of damage with this build, but lack when it comes to mobility or defense. While she can struggle in the later parts of the game, Veera is very strong when able to catch an enemy alone. This build tries to take advantage of that by rushing some damage heavy items and magic pierce to ensure that her abilities are doing as much damage as possible as quickly as possible. We rush Boomstick over Orb of the Magi, wanting to get the ability power and damaging passive of Boomstick right away. Soaring Aura and Staff of Nuul are brought in to compensate for some lower ability power offerings, making each point of damage go as far as possible. Late game we start to build more typical items like Hecate’s Diadem and Holy of Holies to try and prevent as much damage fall off as possible. While great early game, assassination builds grow more vulnerable to enemies as the game wears on and shifts from scattered skirmishes to bigger team fights. A much more cautious approach to Veera, this build foregoes some damage in favor of some added defense. Frosty’s Revenge, Orb of the Magi, Berith’s Agony, and Holy of Holies all contribute to Veera’s survivability along with their ability power offerings. 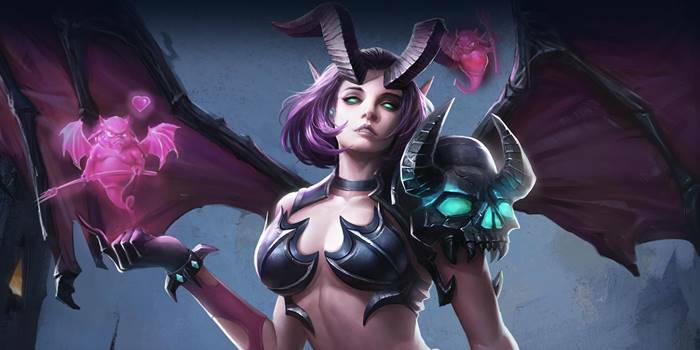 While she will be far from a tank, the succubus will be able to take a few punches in team fights without being immediately knocked down. This is all while still maintaining some ability to damage opponents, the items providing decent amounts of ability power as well.